Would you like to know more about how your school district spends the tens or hundreds of millions of dollars it receives from the taxpayers every year? By the time you finish reading this, you will have some solid tools with which to answer at least some of your questions. 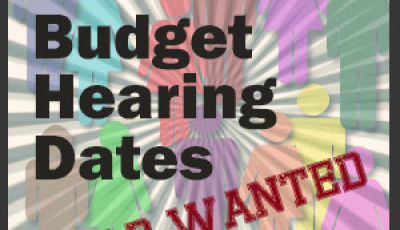 This topic is especially timely considering that school budget hearing season is upon us. Some districts have completed their hearings and even already passed a budget for FY13 (fiscal year 2013: begins October 1, 2012, and ends September 30, 2013), some districts have held their first hearing, and some have yet to hold even their first hearing. 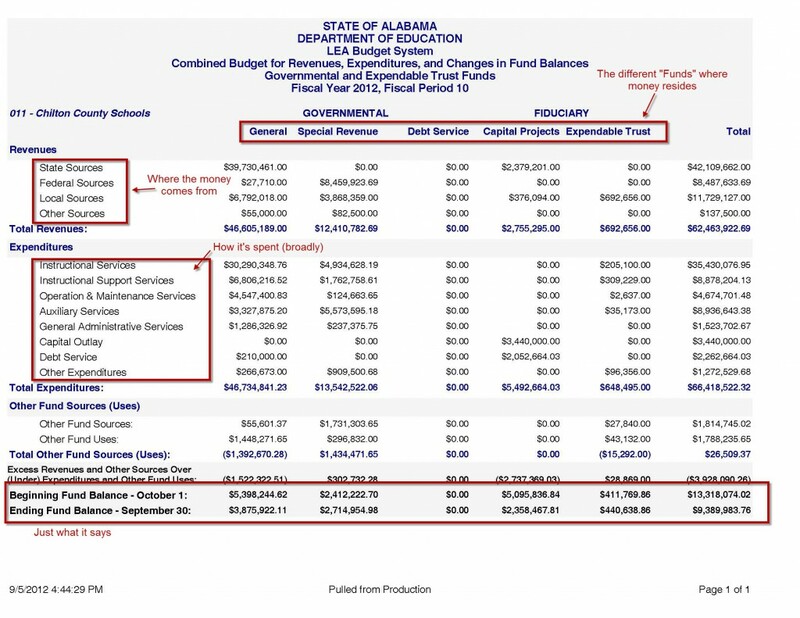 Budgets are due to the ALSDE (Alabama State Department of Education, remember?) by September 15. Why do I bring up budget hearings again? Because budgets and budget hearings are your first best introduction to school finance in your own district. Budgets are policy tools. Budgets dictate how school districts spend money. Budgets dictate where a district’s priorities are. A board of education is responsible for approving a budget and thus the plan for the next year as to how education will be delivered to your school community. Everything flows from the money that is budgeted. You have a right to ask questions about what all those numbers mean. You have a right to ask for an explanation if you don’t understand. Your district’s Chief School Financial Officer (CSFO) should be willing to explain things you don’t understand. And remember, it’s all in how you ask. Be respectful. They have the answers that you are seeking and you need their help to understand. But outside of directly attending a school budget hearing and directly asking your district’s CSFO what all those numbers mean, how can you better learn about how your district spends money? There are a few reports that you can access that can help you better understand, and I am going to show you where to find them. (1) These are only numbers. They do not have a heart or a soul. (2) Unless you have studied accounting and the ALSDE’s specific accounting system, there is a very good chance that you may misinterpret what these numbers mean. Every accounting system has a language unto itself. 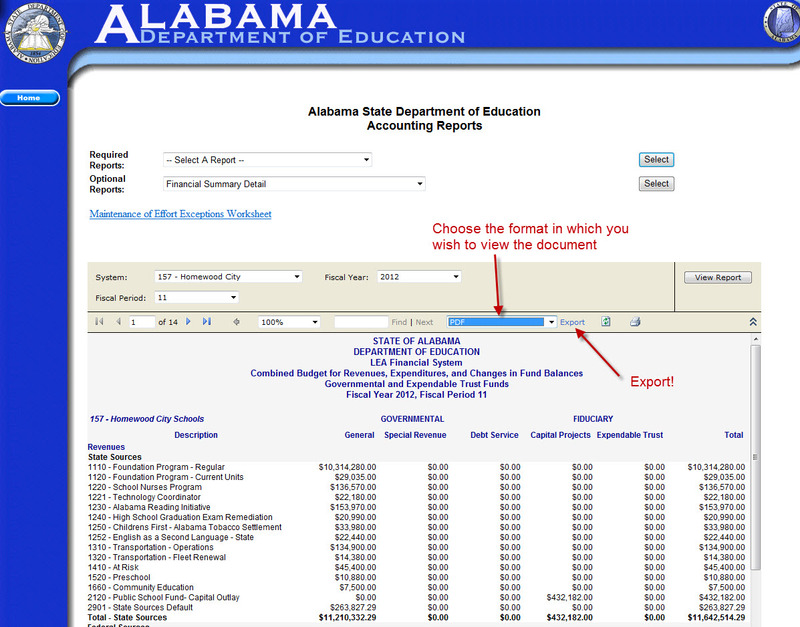 The ALSDE’s Accounting Manual can be found here. (3) You must be responsible with the information that you learn. You will do yourself and others no good by learning a few numbers, misinterpreting what you’ve read, and then repeating and spreading misinformation. (4) If you do not understand the numbers at which you are looking, you should seek to understand them. Reach out to your district’s financial department for help interpreting what you are looking at. If they are no help to you, let your superintendent know about your questions. If you run into a brick wall, contact me, and we might can navigate the path together. If you’re like me, chances are that once you begin looking at these numbers, you will have more questions. That’s a good thing. 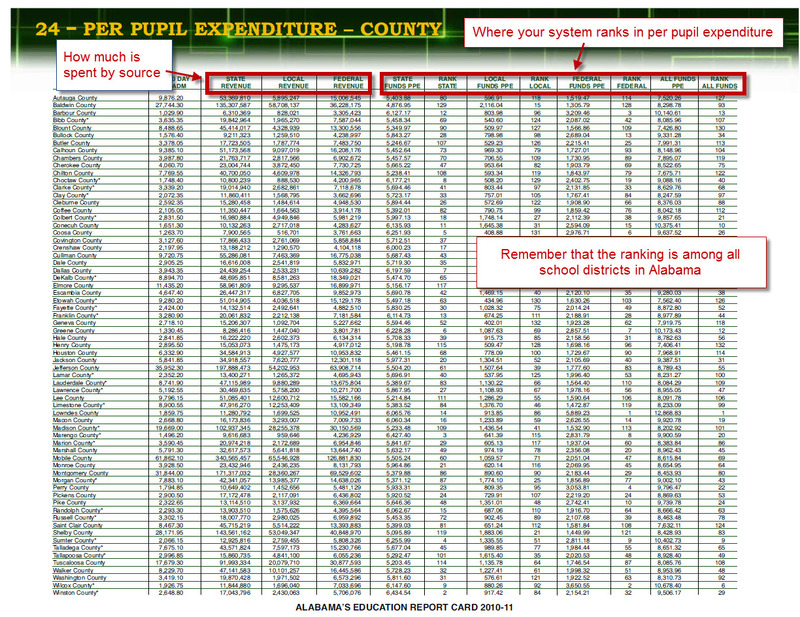 School districts in Alabama spend over $7 BILLION of our tax money: state, federal, and local. Keep track of your questions. And keep track of to whom you ask those questions and what responses you receive. It will begin to spin a tale that makes sense to you. Even if you disagree with your district’s priorities, you will at least begin to understand them. So let’s get started. You can click each image below to enlarge it. The image below shows you the starting point from the ALSDE’s Accounting Reports page. 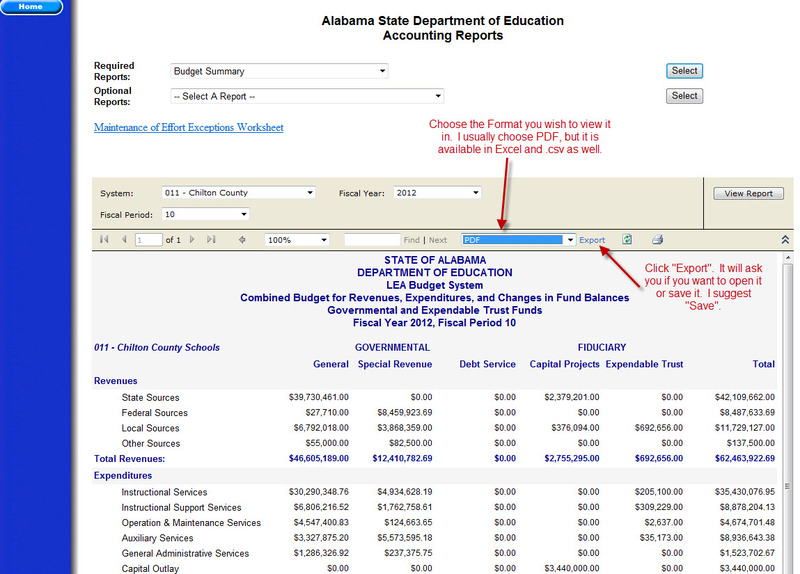 Follow the directions in the image to locate your school system’s budget for FY12 (FY13’s should be posted soon, as budgets are due to the ALSDE by September 15). FY12 stands for what? Yes, fiscal year 2012, which began October 1, 2011, and will conclude on September 30, 2012. We’ll be looking at FY12 to better familiarize ourselves with the reporting system and the reports. After you click “View Report”, you will want to export the report to a more easily-read format. PDFs are easily viewable and searchable. You can export documents in Excel and other formats as well. Now you have it in a PDF. This is the “Budget Summary”. Basic categories. Lumps of money. 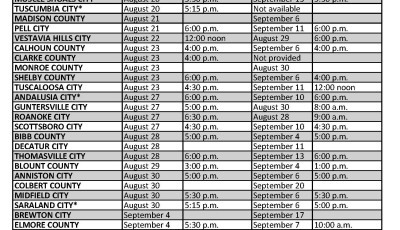 These are also supposed to be available on your district’s web site, but I have found inconsistencies in posting the latest budgets. So now you know you can always find it on the ALSDE’s Accounting Reports page. Go back to Part 2 of the ASC’s School Finance posts for more information on the breakdown of Revenues and Expenditure Categories. The “Funds” are where lumps of money reside. 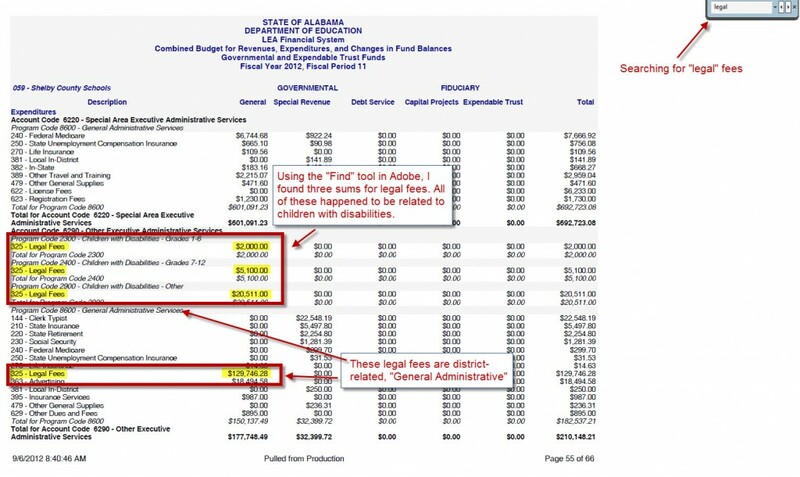 Here are the ALSDE’s definitions of what kinds of money are contained in each Fund. Recognize that many districts transfer monies between funds, and this sometimes makes it difficult to track from which fund the expenditure is truly made. Budgets are characterized by their Total Expenditures. In the example above, the district would be said to have a $66 million budget because it’s Total Expenditures equal $66+ million. 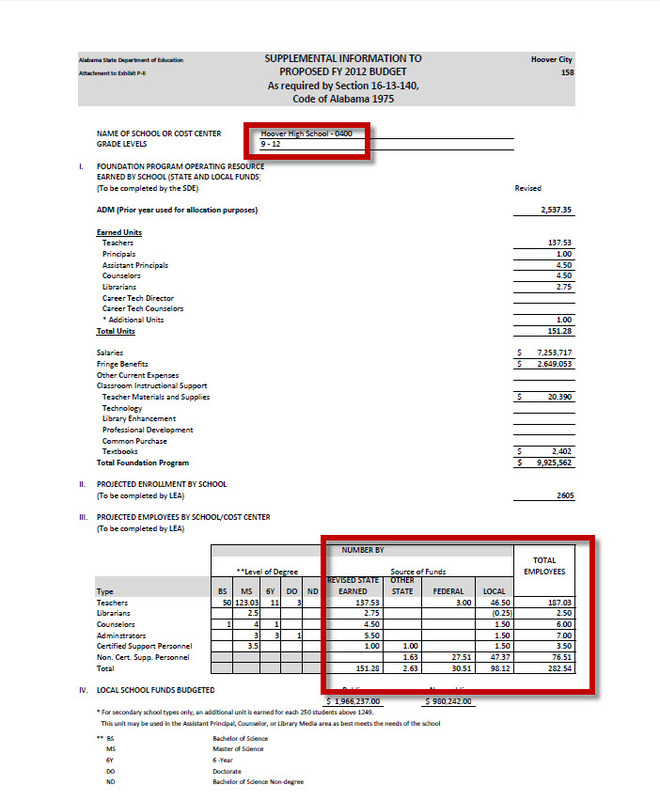 Now let’s go back to the Accounting Reports page and look at one of my favorite reports: the Financial Summary Detail report. CAUTION: Don’t get too excited about all of the “Optional Reports” that are listed. Many are very difficult to interpret. You need guidance from your local district financial folks to fully understand most of them. After you export it, take a look at it. I’ve opened mine in PDF so I can use the search tool. This one is a multi-page report. When you look at revenue sources, it is important to note the two different dimensions, recognizing the source of revenue and noting into which fund the revenue is placed. When you get into expenditures, you need to note out of which fund the expenditures are made. No doubt there is TONS of information contained in this Financial Summary Detail report. And this is a true accounting of monies spent, as opposed to budgeted amounts. Many districts are very detailed in how they assign the accounting codes to their expenditures, and others not so much. What would be really great would be that rather than simply state from which fund the expenditure is made is to identify whether state, federal or local money is used for the expenditure, and if it’s a blend of sources, how much of which source is used. The district’s check registers make that distinction, so it couldn’t be too much of a stretch to make that happen in the district’s financial reports, right? We’ll get to check registers in a moment. 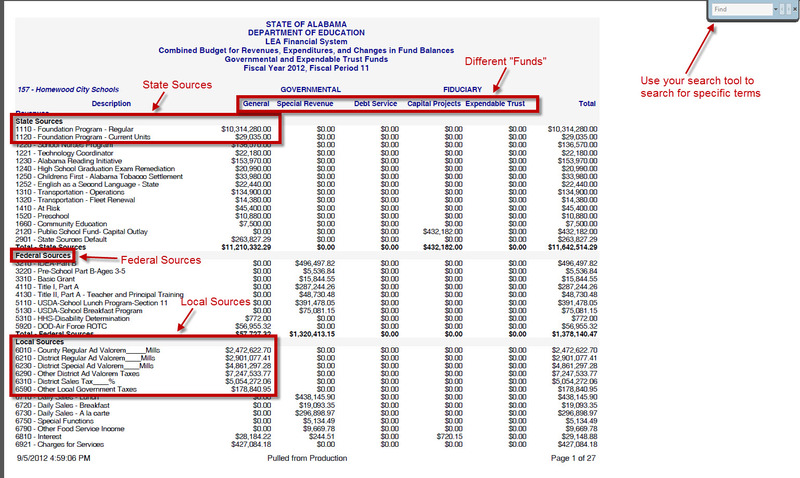 Here’s a look at some of the detail in the expenditures portion of the Financial Summary Detail report. In this figure, I’m searching specifically for “Legal” fees. Many districts will break down how much they pay in supplements for their coaches, how much their extended day care programs cost, how much they collect in lost textbook fines, even how much they spend in travel costs. Ah, the infamous, ubiquitous (which means ever-present and everywhere) “other” category. That’s a post for another day. 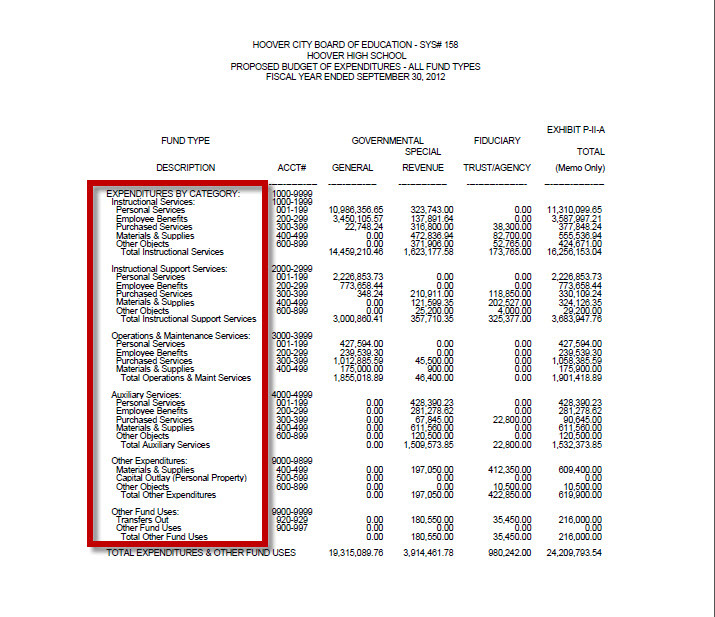 As you can see, there is LOTS of financial information available in the Financial Summary Detail report. Check out this post on the district check register. It’s complete with a video tutorial of where to find it, and how to read it. I mention it here only as an additional source of financial information. Take a look at the register below. Here’s where you can find more detail about to whom those checks are written. Remember, though, that this is only the district’s check register, not the local school’s register. You’ll see a lot of “other” in these registers as well. As a reminder, you can find these registers on your district’s web site. 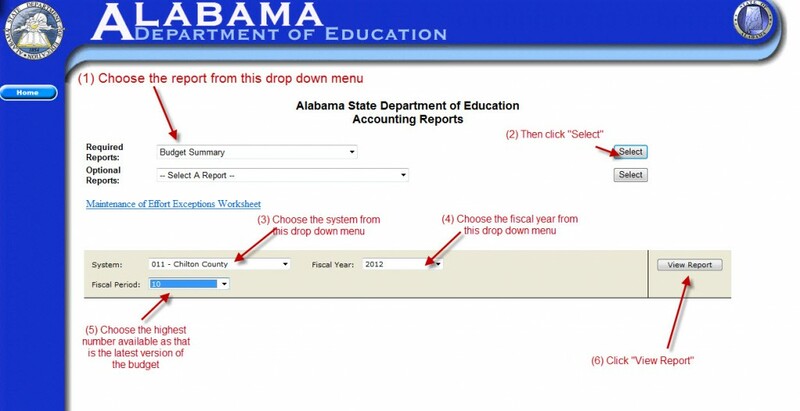 Posting of these registers is required by the ALSDE. Right now, every district in the state should have at least June’s check register posted. The actual requirement for the timing is that the register should be posted not later than 45 days after the end of the month. So July’s registers should be online soon. Some districts appear to have a tough time with the requirement. Where other districts are way ahead of the posting requirement. The check register is where you learn with whom your district is doing business. With whom are they contracting? How much are they paying for utilities? While it would be nice to have more user-friendly and easily-accessible, meaningful financial reports, we must work with what is available to us for now. And still keep working for better reporting systems. Again, this is budget hearing season. In addition to presenting all of the required forms in their dry format, many districts are now putting together meaningful presentations for their boards and those in attendance at budget hearings. They are sharing comparisons of revenue from year to year, looking at per-pupil expenditures and how the economic downturn has affected those expenditures. All of this information is very helpful to folks who want to learn how school finance affects the delivery of their community’s public education. It truly is worth your time to attend a budget hearing. Here’s a quick video about why bother and what you might learn. In my opinion, the document shown below is one of the most important documents provided at your district’s budget hearing. 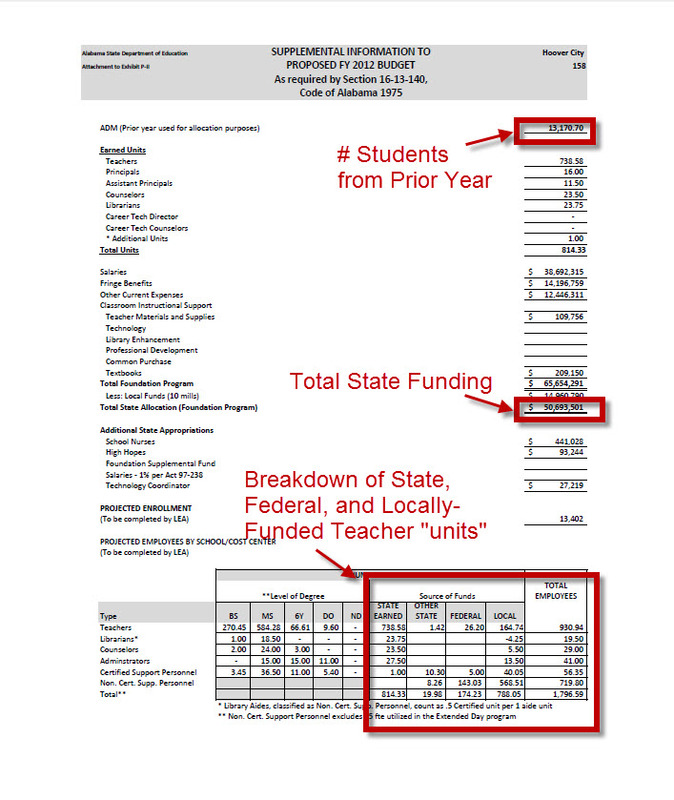 It shows the calculations that are used by the state in allocating state funding under the Foundation Program. Attendance from the prior school year is used (allowances are made for growth from year to year in other ways in the budget). Look at the big red box at the bottom of the page. The big red box shows the breakdown of how many teachers, librarians, counselors, administrators and other personnel are being paid: with state, federal, or local funds. 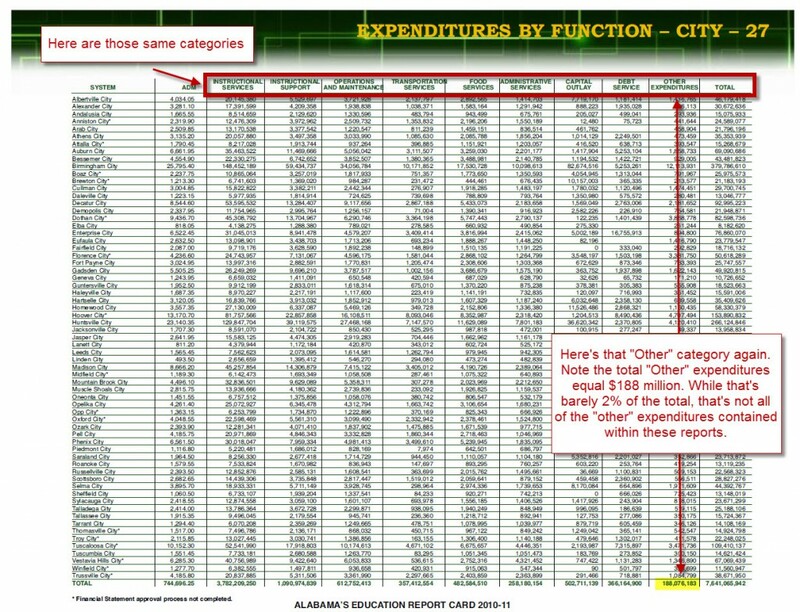 In the example above, which is from Hoover City Schools’ FY12 budget hearing, it is clear that nearly all non-certified support personnel (special education aides, bus drivers, for example) are paid for with local funds. Nearly one-third of administrators are paid with local funds as well. And this breakdown has nothing to do with the Central Office of each district. This only reflects personnel housed within schools. Here’s a look at the breakdown for Hoover High School. This breakdown by school is shared only at the budget hearing. It is not required for districts to post on their web site, but Hoover has included it in their budget posting. As you can see in the box at the bottom, nearly one-fourth of the teachers housed at the school are paid for with local funds. And while the state covers the cost of 5.50 administrators, the local system picks up the cost for 1.50 administrators. Districts who have little local money must make do with the number of teachers for whom the state provides their salaries. And while research is not conclusive as to whether small class sizes equal better education, most of us would agree that we would rather see our students in a class of 25 rather than a class of 40. Especially in high school. Here’s another document you will be given at your district’s budget hearing. It is a breakdown by school of expenditures by categories. I, too, would prefer more detail, but this is all that is currently offered. 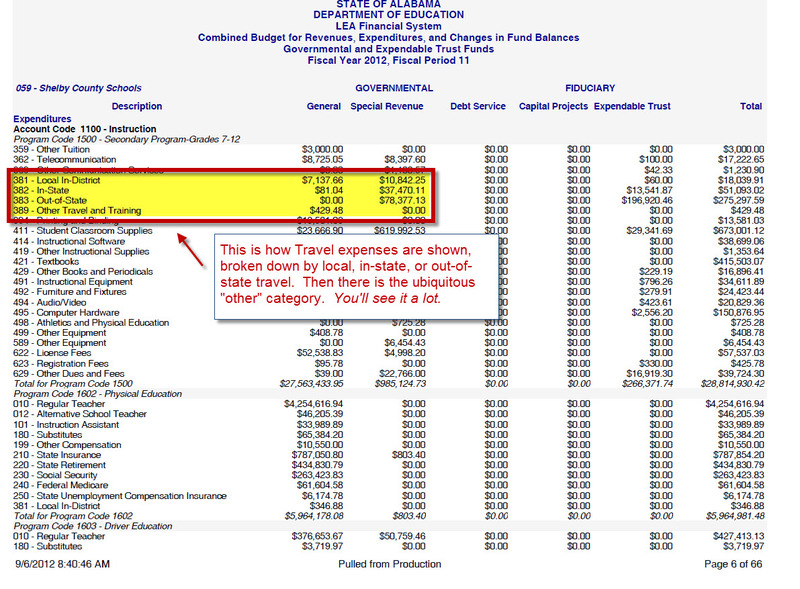 One good way to use this document is to compare expenditures across schools in your district. A common concern I hear is that “the other elementary school gets all this new stuff, and my child’s school doesn’t even have a copy machine” or something to that effect. It is interesting to compare these documents to determine if funds are being distributed fairly across schools within the district, at least among schools of similar grade configurations (elementary, middle, K-8, high). Everybody loves a good comparison document. We like to know where we stand in relation to other school districts. Fortunately, this comparison exists in readable form. 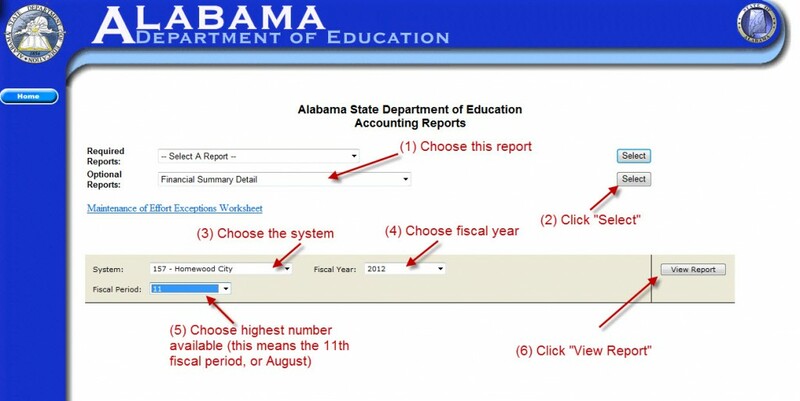 Here’s where all of the ALSDE’s Annual Reports are currently housed. If you take a look at the 2010-2011 Annual Report (the most recent one available), you will find both revenue and expenditure data by County and City system. 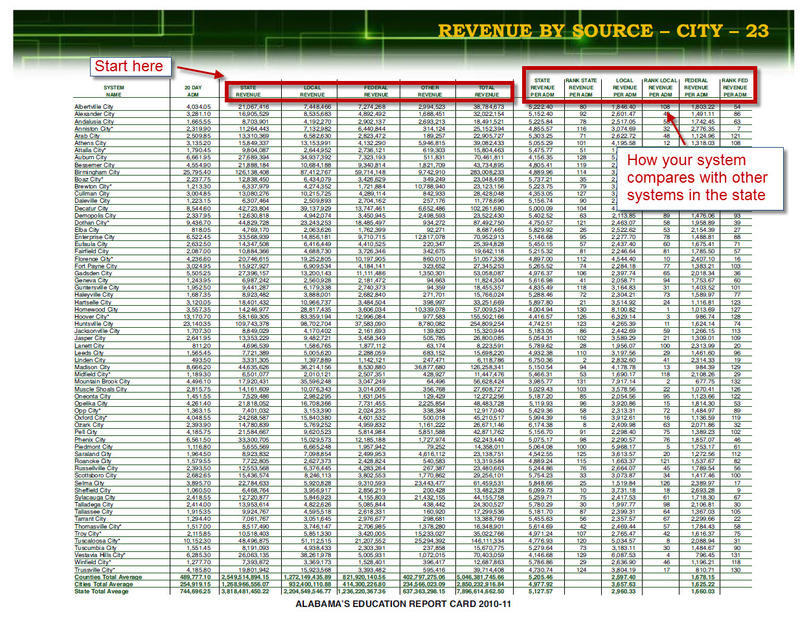 The City Revenue breakdown is below. The Expenditure data exists as well. And then there is the breakdown of expenditures by category, but no rankings are provided, as it is not broken down by pupil, which was the basis for the other rankings. Yep, there’s that “other” category again. Well, that concludes today’s presentation. If your district hasn’t yet held its budget hearings, seriously consider popping in and at least picking up a copy of the documents provided so you can have them for future reference. Don’t forget the most important point of all of this: the budget directs the expenditure of money to carry out the policies formulated and approved by your board of education. The board sets the policy, sets the goals for the superintendent, and then approves the budget that the superintendent is to utilize to bring the board’s (and thus the community’s) vision to reality. What does your community’s reality look like? Does your district’s budget accurately reflect what your school community’s priorities are? Are your district’s expenditures in line with what your school community believes which activities monies should be expended upon? The only way to answer that question is to find out for yourself. Hopefully the tools and reports I’ve shared here will help you do just that. As always, please leave comments and questions either here or on the ASC facebook page.